Case workers and case managers can use tags to classify, group, manage, and report on tagged cases. Tags can indicate trends and help extend your application; frequently-used tags may indicate the need for additional classes and properties. This article describes the tagging-related features of collaborative case management. A tag is a text value that case workers and case managers can associate with one or more cases. They can select from a list of available tags or create new tags. Case managers can search, access and report on tagged cases. Developers can create an initial list of tags from which users can select and add or remove tags from this list of "seed tags" at any time. Tags are useful in flagging cases. Case workers and case managers can use tags to group or categorize open or resolved items in any way they like. For example, a case manager working with an insurance application might create a tag, hurricane_katrina, to flag cases related to an unforeseen event, such as a natural disaster. Developers of a financial application may create seed tags priority01, priority02, and priority03 for their users, while case workers in another application may use tags to flag specific types of issues, for example, customer_satisfaction. You can enable tagging in the Work-.pyWorkToolbar section of the standard Perform, Review, and Confirm harnesses. 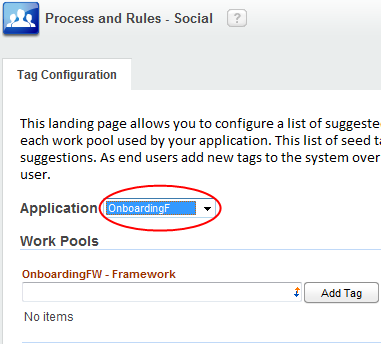 During development, you can create an initial list of tags for the selected application and work pool. These tags are known as seed tags and provide end users with tagging suggestions. Users can add tags from user forms, however they cannot add seed tags. Seed tags, unlike unused user-generated tags, are not purged by the Pega-EndUserUI agent. You can create seed tags or delete seed tags at any time. Select > Process and Rules > Social > Tag Configuration. On the Tag Configuration tab, select the application. A list of work pools associated with the application displays. You can configure a unique list of seed tags for each work pool used by your application. In the field below the work pool in which you want to add a seed tag, type the tag name. In this case, customer_satisfaction. Tags cannot contain spaces and are limited to 64 characters. Duplicate tag names are not permitted. Click Add Tag. The seed tag displays in the list below the work pool and is now available to case workers and managers. To delete a seed tag, select the tag and click the Delete icon. At runtime, users can add to the list of available tags by clicking the Tags icon on user forms and typing a new tag name. Privileges are not required to add a tag. A lock is not required to tag a case. Users can tag a case regardless of the case's current status. Access the item and click Tags in the header. The Manage Tags dialog displays. In the Manage Tags dialog, type a character contained in the tag, for example, the letter c.
Use the down arrow to highlight the tag you want to select, and then press Enter. Click to associate this tag with the case. The tag now appears in the list of Associated Tags. It is added to this case and is available for selection by others within the work pool. You can associate additional tags with this case or, if you have finished adding tags to the case, click to close the Manage Tags dialog. In the Manage Tags dialog, type a new tag name and then click . A tag can contain up to 64 characters and cannot contain spaces. The tag appears appears in the Associated Tags list, is associated with the current case, and is available for selection by others within the work pool. To delete a tag from a case, click the Delete icon associated with the tag you want to remove. This deletes the link from the tag to the case; it does not delete the tag from the database table. The Pega-EndUserUI agent automatically purges unused user-generated tags (orphan tags). See Pega-EndUserUI agent in the Developer Help. Case workers and managers can search for tags by typing all or a portion of the tag name in the search field in the portal header, in this case, blizzard. Tags containing the search term display in the Matching Tags area. Click the tag name in the Matching Tags list to view cases flagged with this tag, for example, blizzard_dec2012. The Tag Deck (Data-Social-Tag pyTagDeck) displays. Related Tags — displays a cloud of tags used in conjunction with the currently selected tag. Click one of these related tags to view the tag deck for that tag. Case managers can also access the Tag Deck by clicking a tag in the Popular Tags cloud on the My Dashboard tab in the Case Manager portal. Hover the mouse pointer over a tag to display the number of work items associated with the tag. Click a tag to open the Tag Deck and manage work items associated with the selected tag. A tag is stored as an instance of the Data-Social-Tag class. The association of a tag with a case is stored as an instance of the Link-Tag class. Note: To move tags from one system to another, move all instances of these two classes; do not use the Package Work wizard. Tags are useful in flagging cases. Case workers and case managers can use tags to group, categorize and collaborate on cases.